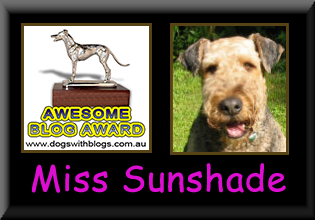 Life of Miss Sunshade - The Vancouver SuperDALE: UN-INVITED VISITORS!!!! Mom was in the livingroom watching her show when all of a sudden, she heard all the dogs in our neighborhood barking like crazy. Since I wasn't barking, mom ignored the chaos. 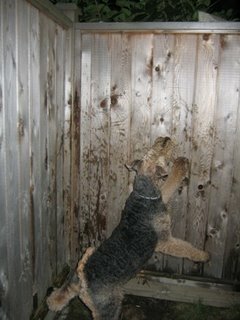 However, soon afterwards, mom started to hear the sound of my "bouncing off" or "BANGING" against my 6 foot fence. So she came out to the yard to see what was going on. 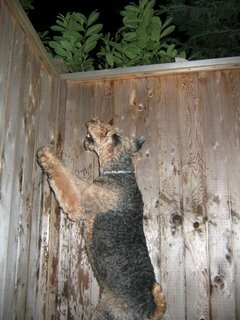 From the way I was acting, mom knew there must be something behind the fence, so she waited while I continued to jump and bounce off the fence, taking pieces of the fencing panels down with me each time. 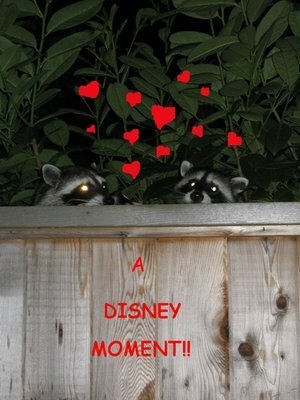 OK, mom put those red hearts in, but seriously, those raccoons were NASTY and RUDE. They were making that tough hissing sound at me and even at mom. I could hear them say "damn it, that stupid dog is there again!! "and "how are we gonna get the bone?? ". 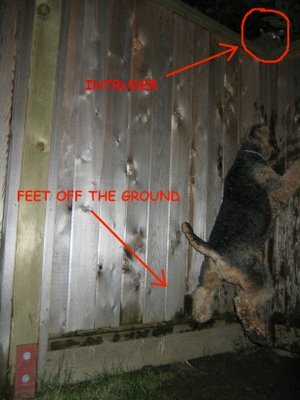 So now I know where all my left over bones had gone to............ you b$st&rds!! EXCUSE ME......WHO DID YOU SAY WAS STUPID??? So I showed them my POWER!!! Boy did that ever shut them up!!! HA HA HA! I mean, if they wanted to come and feast in MY yard, you would think they would've asked "nicely", and not call me "STUPID". Oh well, I wouldn't have let them in anyway even if they called me an attractive genius. Gotta keep my terrier pride ya know....... Anyway, so this is my exciting night, I'm off to bed now. hey miss sunshade, are you sure you are not jealous of them making out? That's a good terrier nose, Sunshade. First the mice in the rug and now this! You really get a lot of hunting experience. Be careful though, raccoons can carry stuff in their salivia that can kill you or can make you paralyzed like my dear friend. Its called Coonhound paralysis and its ugly. Just be careful dear heart. I don't want anything to happen to you! Mackie is right, be very careful around those mean vermin. They even have the nerve to come up on our Mama's deck and poop all over. Yuck! 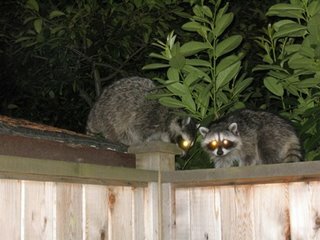 One night they were scratching on the front door, begging to come into the house. You can even catch a nasty bacteria from their urine if you would happen to step in it and forget and lick your foot! Just tell your Mama to get out her big gun and blow them away like our Mama does, hehe, woof woof! you and Charlie just crack me (and my mom) up so much!!! You guys are the coolest Labs! I'm sure I wasn't jealous of them.....I was MAD about them taking my bones and talking behind my back!!! We saw your comment asking about the fleece jumper. Mama says to measure you from the base of your neck along your back to the base of your tail. Are you 26" or under??? If so, Mama could make you one that will fit you. She has pretty pink camoflauge fleece, or can use plain pink, or she has some pink with neat light purple flowers on it. Or if you request a color, she can go buy it too. If you are 19-22", you would wear the size Large which is $34.00. If you are 23-26" Xlarge is $40.00 plus shipping. You can send Mama an email from our profile page if you are interested and she could email you pics of the fabrics if you like. Just let her know! Thanks for asking!!! Check out our yahoo 360 blog, Mama doctored up some of your recent pics and posted one. You'll like it!